Finished pick up posed next to an "Airfix" Zodiac to remind us just how small minis are! 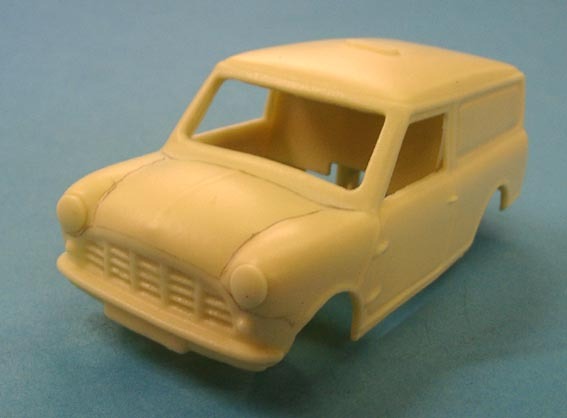 As briefly mentioned in part one the details of the mini commercials is a little blurry (for want of a better description), if you imagine a vac forming having been taken of a detailed model then you get the idea. Scaling however is spot on 1/32nd. Basicaly most of these are missing, apart from the door gaps. As can be seen in the picture of the van (right) the missing gaps were penciled in before being scribed with a Bare Metal Foil panel scriber. This included the wing/front panel join below the headlamps, which is also missing on the Airfix mini but is present on the Scalex version. As mentioned in part one the windscreen is rather too straight and I had to compromise with the line of the rear edge of the bonnet, toning down its curve a little to keep things looking right.While the scriber was out I deepened the door gaps a little to make them more defined but take care as the resin is a little thin in places. These benefit from a little sharpening up with the corner of a chisel plus the one over the windscreen was replaced with a thin strip of plastic. A lot can be done to improve the front end. The headlights look like they are missing the chrome rims but this was easily rectified with some plastic micro strip. 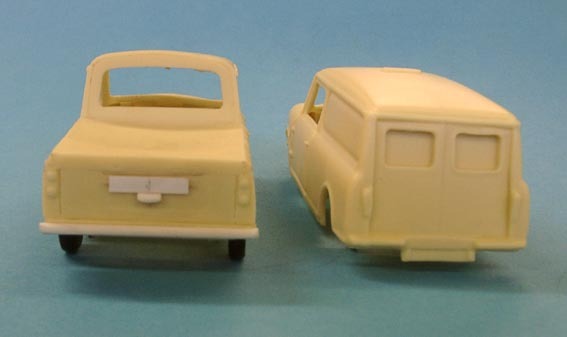 I also fitted a bonnet badge (Austin in my case) with a small square of plastic, although you could take the Morris badge from an Airfix mini if prefered. The grill posed a bit of a problem, it doesn't have the right number of bars plus is solid. I decided to carefuly carve out between the bars although this does tend to draw more attention to there being the wrong number. 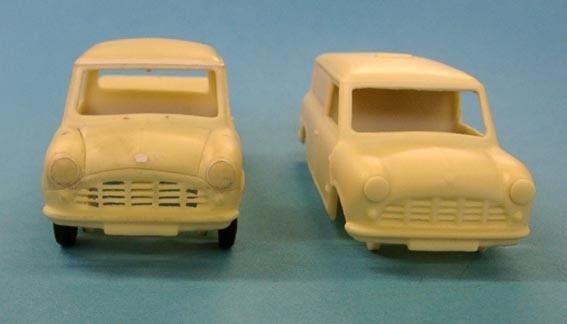 Leave the very ends of the bars solid (see picture above) to match the real cars - the grill is part of the front panel pressing on the commercials rather than a seperate part as on saloons.This means there is no difference between the Austin and Morris versions and the grill is painted body colour. As a final touch windscreen wipers were made from fuse wire and very thin brass sheet. A hint here is to use a very small wad punch (say 1/8th inch) to punch out discs and solder to thin fuse wire to make a convincing period mirror. Commercials by law at that time required two wing mirrors, as did estate cars which were classed as commercials whereas cars only needed one.A nice touch might be to replace the indicators with those from an Airfix Frogeye but I didn't have any handy. I did however use some very fine silver sticky backed lining to represent the seal on the sliding door windows. As I said at the beginning, there may well be nothing wrong with the rear end of the pick up but I was working from a period BMC publicity shot of 346 HJO and this featured the high level number plate (hinged at the top so it would still be visible with the tailgate open) and a full width bumper. The number plate was simple enough to construct from plastic card etc as was the bumper, which was fitted after carving off the original quarter bumpers and number plate. It's nice to see some commercials being made instead of the usual saloon cars and these are very well made. As I was originaly a static modeller I have been over picky and great results can be had with just a coat of paint. However they do repay a bit of effort to make a very nice static model. Painted in Ford Windsor grey and with bare metal foil applied to bumpers etc. Number plates were generated on the computer, as was the period tax disc.